With assembly elections approaching, party hoppers are having a whale of a time in Bihar. While many of them have already switched loyalties, others are waiting for right options before moving out of their zones of discomfort. 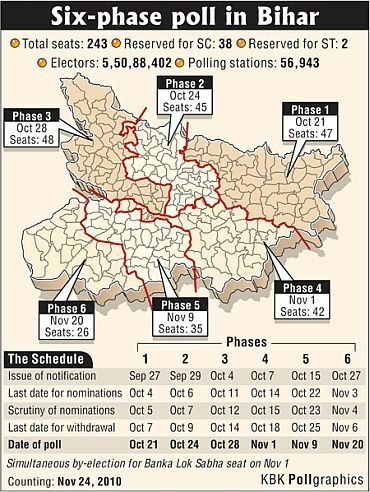 As the assembly poll is expected to be a tight triangular contest between Janata Dal-United-Bharatiya Janata Party, Rashtriya Janata Dal-Lok Janshakti Party and Congress, all parties have witnessed the phenomenon of new admissions and desertions as also emergence of new equations. Rajiv Ranjan Singh "Lallan", the right hand man of Chief Minister Nitish Kumar is now miles away from him and is singing the paens of Congress. It is another matter that he has not left the JD(U) to avoid disqualification as an MP. In the latest case, senior RJD leader Akhilesh Singh has resigned from the primary membership of the party and is on his way to join Congress. Former state agriculture minister and JD-U leader Nagmani is a "much travelled" person. He has been with BJP, Congress, JD-U and RJD and has now re-joined Congress claiming that whichever party he sided with came to power in the state. 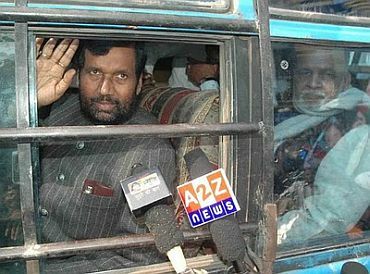 RJD chief Lalu Prasad's brother-in-law Subhash Yadav and former BJP MP Sukhdev Paswan are also warming up to Congress. Anirudh Prasad Yadav alias Sadhu Yadav, another brother-in-law of the RJD chief who had joined Congress during the last Lok Sabha elections, is now a key figure in the Congress publicity campaign. 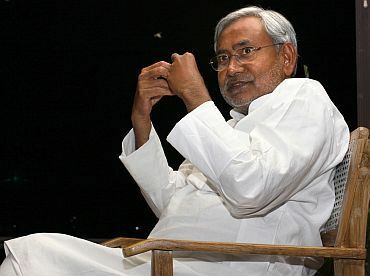 A key upper caste leader Prabhunath Singh, who was once a bitter critic of the RJD chief, joined his party recently, parting ways with Nitish Kumar. Sulking after the inclusion of his bete noire Prabhunath Singh in RJD, party MP Umashankar Singh has resigned from the party's parliamentary board and is likely to switch sides. Umashankar Singh was earlier with JD-U. Congress leader Gridhari Yadav joined JD-U this month. A former RJD leader, Yadav, had left Lalu Prasad's party and had joined Congress after being denied the party ticket in 2009 Lok Sabha polls. Former Union minister Mohammad Taslimuddin joined ruling JD-U in July this year. Taslimuddin, a former RJD member, had quit the party in August last year. Welcoming him to the JD-U fold, Kumar said he had moved to the "right party". 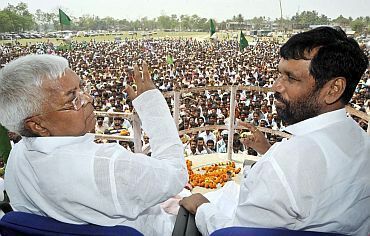 Ram Vilas Paswan-led LJP Minority Cell's former chief Syed Afzal Abbas, Vice-presidents Masoom Raza and Choudhary Masood Alam, besides 14 general secretaries, four secretaries and treasurer joined JD-U along with their supporters over the weekend saying he was impressed by the works being carried out by Kumar for the development and welfare of minorities. CPI-member and former MP Subodh Rai joined JD-U on September 1 singing paens of Nitish Kumar. Senior JD-U leader and former vice-chairman of the state Legislative Council Virendra Kumar Choudhary joined RJD in July this year. Welcoming Choudhary and others into the party fold, Prasad said it would further strengthen the party in Mithilanchal belt in Bihar. Former Excise Minister in Nitish Kumar government Jamshed Ashraf joined Congress along with an ex-president of JD-S and a former head of the state unit of NCP in the same month. In yet another recent development, Mohan Singh, a general secretary of LJP's Youth Wing, has announced his resignation from the party levelling allegations of money demand from him in lieu of party ticket. Sources said Singh is likely to join JD-U. Lalu and Paswan are fighting together a desperate battle after being out in the cold following defeats in last two elections -- 2005 assembly polls and 2009 Lok Sabha polls. 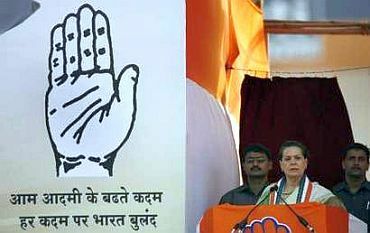 The Congress, which has been out of power for last 20 years in the state is attempting to break fresh ground and is contesting the elections alone, which is being seen as its attempt to consolidate party base with an eye on the next assembly elections in 2014.